Truly, it happened to me many times and I'm sure it will happen to you too once you got into card making. Try it! Instead of going out to look for that stunning birthday greeting card for a friend or family member, make it yourself or if it's a birthday card for a child, make it with your children. So head down to my OhHappyBirthday.com and browse all the handmade birthday greetings and related stuff. click here to view instructions for making this card. Missed a birthday! Nevermind, make a belated birthday greeting card instead. This candle birthday greeting card is suitable for anyone - male or female, young or old. The candle in the card is cut out from a piece of white cardstock scrap. After cutting out the candle shape, just paint with watercolors to make it look like a candle. Someone's celebrating his or her 50th birthday. Well, reaching the big five-0 is definitely a time for celebration. So make the card ahead of time. Tell him or her how fabulous being fifty is. Definitely not someone who's over the hill. A 60th birthday card for a friend who's a musician. This birthday greeting card was made with a music theme patterned paper, die cut numerals '6' and '0'. You will also be able to view the inside of the card and see how you can add birthday greetings with tiny alphabet rubber stamps. Valerie Smith is my online friend. She loves cardmaking and we got to know one another through this wonderful hobby. Here are some birthday cards she had created. Valerie has graciously allowed me to upload them here to share with you. Thanks, Val! Keep on creating. You are bringing joy to so many people. click here to view more of Valerie's cards. A few more handmade birthday greetings that are quite easy to make. Most of these use silk flowers, buttons, beads and ribbons. click here to view these embellished cards. 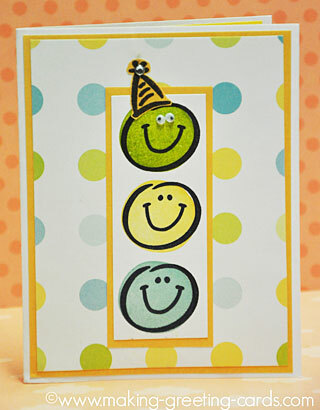 Need more card ideas for your happy birthday greeting cards? Here are just a few more ideas to try out. Hope these cardmaking ideas will inspire you to make more greeting cards and send them out to cheer and encourage your friends and family members. click here to find out where to get ideas. Need a birthday verse to put inside your handmade greeting card? Here are some birthday verses that might be helpful to you. Choose any one of them for your card. Print it out on a piece of writing paper to insert inside your birthday greeting card. click here to read the birthday verses. Hope to make more of these Happy Birthday cards and add them here. So do check back often or join my Making Greeting Cards Facebook group or Google+ community.